The Israeli military confirmed that two rockets were fired towards central Israel on Thursday evening. Shin Bet Head Nadav Argaman met with Hamas representatives in Cairo after two rockets were fired at Tel Aviv Thursday night, according to The Independent, a London based newspaper. The meeting took place in order to discuss a possible ceasefire with Hamas. According to the report, Argaman promised that Israel would ease the blockade on the Gaza Strip and that Hamas and Israel would staff the border crossings in Kerem Shalom and Erez and reopen the Karni industrial zone. In addition to there would be an Egyptian agreement to open the Rafah crossing on a permanent basis.Prime Minister’s Office denied that it knew about the meeting. 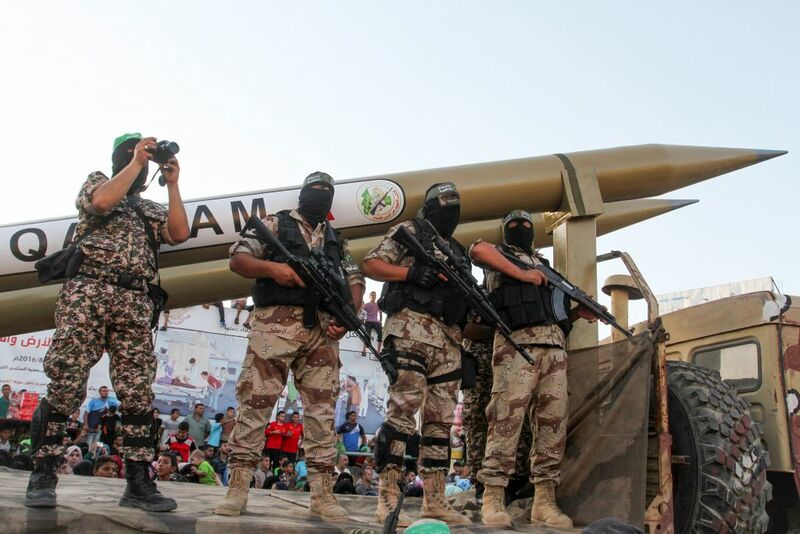 According to initial reports, the two Fajr rockets were fired by Palestinian Islamic Jihad (PIJ) in Gaza, the second strongest group in the coastal enclave after Hamas. Anna Ahronheim contributed to the report. After Thursday night’s lack of clarity in the wake over the origins of the two rockets fired from Gaza at the Tel Aviv area, the IDF on Friday morning stated that the Hamas terror organization was behind the attack. One of the rockets landed in an unpopulated area and the second apparently disintegrated in midair.The IDF also assessed that the rockets were fired by mistake. But given that this is not the first time that this has happened, we can allow ourselves to be a little skeptical. The skepticism stems from the fact that in October of last year – when rockets were fired from Gaza at Be’er Sheva (hitting a family home) and the central region (falling into the sea) – Hamas fired at Israeli population centers and then denied all responsibility.In October, Israel accepted Hamas’ curious claim that the rockets had been discharged accidentally because of the poor weather. This time, the IDF has accepted that this was an accident, due to the reliability of its sources. Hamas denied firing the rockets, and on Thursday even released the unusual statement that it would punish those responsible. The claim is that the people who fired the rockets did so without permission from the leadership of Hamas, which rules the Gaza Strip. It seems that Hamas wants the best of both worlds – enjoying the impact of rocket fire on Israel, without taking responsibility for it. So why did Hamas fire the rockets (if it were deliberate)? For two major reasons. Firstly, because of the serious and exceptional riots that took place Thursday in Gaza with the rallying cry of “let us live,” in which the Hamas police force used considerable violence against Gaza residents. The organization’s leadership felt threatened as it has not felt since it seized power in the Gaza Strip in 2007. Secondly, because of the talks with the Egyptians over a lull in the tensions along the Israel-Gaza border, which have been going on for some time. Hamas has a long list of demands, including $30 million a month (the payments from Qatar are supposed to end in April, and it is unclear whether they will continue), funding for UN-sponsored jobs, an increased electricity supply and an increased range for fishing. Israel says that this is indeed possible, if Hamas puts an end to the “marches of return” along the security fence, the launching of the aerial incendiary and explosive devices that have become increasingly dangerous, and definitely the firing of rockets. The wheat in the south of Israel is about to ripen, and if the fields are burned, the damage will be considerable. Hamas is saying no, the marches will continue and we will keep them in check (although they were canceled for Friday, as apparently Hamas realized that a red line had been crossed). So with talks apparently at a dead end, and in the face of a mass protest within Gaza over living conditions, Hamas realized it had to urgently channel the anger and frustration of the people under its rule at Israel. The IDF’s overnight response to the rocket fire included an exceptionally severe attack on the infrastructure and facilities belonging to the Hamas military wing (nor did Islamic Jihad emerge unscathed from the airstrikes). But given that Israel has no desire to see an escalation that would require a ground invasion of Gaza during an election campaign, and so that residents of the south would not claim that only attacks on Tel Aviv elicit a harsh response, the reaction was overall relatively restrained. Furthermore, Hamas ensured that its facilities were evacuated before the Israeli strikes began, and the IDF had no real possibility of harming senior officials, even if there had been any real desire to do so. Both the Hamas rocket fire and the Israeli response fell within the same scale of proportionality, in which a major campaign was avoided as both sides sought to limit the incident to a short flare-up. Even so, there are two things that could jeopardize the efforts for calm: the “marches of return” may have been canceled for Friday, but there could still be riots as Gazans mark the first anniversary of these protests at the end of the month. The second risk is of a random incident, such as a severe outcome during rocket fire at Israel or in one of the IDF attacks in Gaza. Either way, the Israeli army is ready for an escalation. The two Gaza rockets that almost brought Israel and Hamas to war late Thursday were fired by accident, Israel’s Channel 13 news reported Friday, when low-level Hamas operatives “messed with” a Gaza beach rocket launcher that was set up to fire toward Tel Aviv in the event of future conflict. The report said the farcical chain of events that almost led to war was “like something out of Monty Python,” referring to the legendary British comedy group. The report said news of rocket sirens blaring in Tel Aviv broke as Yihya Sinwar and other Hamas leaders were meeting with an Egyptian delegation trying to mediate eased Israeli economic restrictions on Gaza. “You’re meeting with us at the same time as you’re firing on Tel Aviv?” the Egyptians reportedly asked Sinwar in fury. He told them he knew nothing about the matter, went to check, and established what had happened, the report said. The Egyptians then called Israeli defense chiefs and relayed what they had been told. Israel told the Egyptian delegation to leave Gaza — the delegates crossed into Israel at the Erez crossing — and then began its retaliatory strikes on Hamas targets. Had the rocket fire been deliberate, the Israeli response would have been five times heavier, the TV report said. The rocket fire was the first at Tel Aviv since 2014. The Egyptians reportedly told Hamas that if it responded heavily to the Israeli strikes, there would be a major escalation of conflict. Hamas did fire several more rockets across the border early Friday. The TV report said Hamas has arrested one or more operatives over the “accidental” fire. It also said that Hamas had proved that it fully controls the weekly Gaza border protests by acting to cancel Friday’s gatherings to ensure relative calm prevailed. The report noted that Palestinian Authority sources in Ramallah doubt the Hamas account of accidental fire. Israeli army sources, however, have indicated they also consider the rocket launches to have been accidental. In response to the two rockets fired at Tel Aviv, which did not hit residential areas and caused no direct injury, Israeli war planes hit over 100 Hamas targets in the Gaza Strip overnight Thursday-Friday. Israel holds Hamas, the Islamist terror group that rules the Strip, responsible for any attacks emanating from the coastal enclave. The growing assumption among Israeli army officials is that Thursday’s rockets were fired from Gaza toward Tel Aviv by mistake, a defense official had said earlier Friday. A Hamas official on Thursday told the The Times of Israel that the terror group “has no interest in an escalation” with Israel. The official said he had “no idea” who fired rockets toward Tel Aviv. The Hamas-run interior ministry called the rocket fire “outside the national consensus” and said it would exact measures against those behind it. Initial reports had indicated that the Palestinian Islamic Jihad (PIJ) terror group was responsible for the rocket fire. Hebrew-language media reported that Fajr missiles were launched, which PIJ has in its arsenal.